Follow the Formula 1™ season with PitlaneOne. The app provides everything you need to stay up to date during the year in an easy-to-use Windows 8.1-optimized user interface. 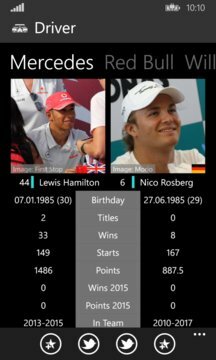 NEWS - Set up your favorite news source to get all F1™-related news. Read them either in IE or an eye-friendly browser directly in PitlaneOne. RACES - Do not miss any race with the calendar in PitlaneOne providing all race and track data, start times, a countdown to the next session and qualifying and race results. STANDINGS - Find out who is leading the Driver and Constructor Championship in an easy way. 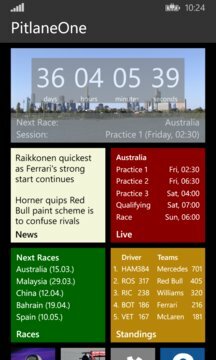 LIVE (beta) - Follow sessions live on your phone if you cannot watch them with the unofficial live scoring by ScoresPro.com (only for races), live comments and additional data provided by myself. F1, FORMULA 1, FORMULA ONE and related logos are trademarks of Formula One Licensing BV. All rights reserved. This application is unofficial and is not associated in any way with the Formula One group of companies.